This week's Tuesdays With Dorie baking challenge is Dorie's Allspice Muffins, chosen by Kayte of Grandma's Kitchen Table (who has the recipe within her blog). If you're looking for a crumb cake treat, this one fits the bill! 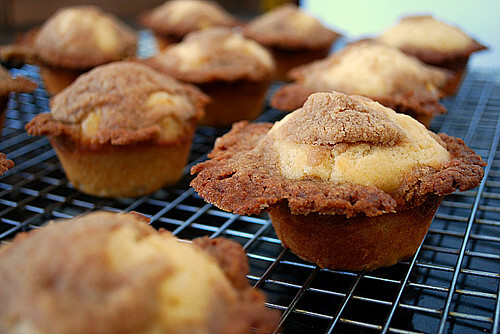 Dorie's Allspice Muffins remind me of mini coffee cakes. Maybe it's the brown sugar streusel or the tender crumb of these muffins, but regardless, these muffins are delicious and so easy! Using ingredients that may already be in your pantry, you're not too far fresh, hot muffins from your oven. The batter consists of flour, sugar, baking powder, allspice, salt, light brown sugar, butter, eggs, milk, and vanilla extract. A touch of freshly grated lemon zest is optional, but I like the little bit of zing they add to the muffin. The streusel is nothing more than flour, light brown sugar, allspice and butter. These muffins are best the day they are made but as they sit, the allspice tends to come out and gets a bit spicier. Either way, it's definitely a muffin recipe I plan on trying again and perhaps adding in some nuts or dried fruit for additional texture. You can find the recipe for these muffins in Kayte's blog within the link provided above. Don't forget to check out how the other TWD bakers did with their muffins! Those muffins look fantastic - now I wish I'd put some lemon zest in mine. Yay! You loved the muffins and added the lemon zest. Very nice! I wish I had thought of adding diced Granny Smith apple. Love all that brown sugar crunchy topping. I forgot about the lemon zest - I'll bet it was really good.